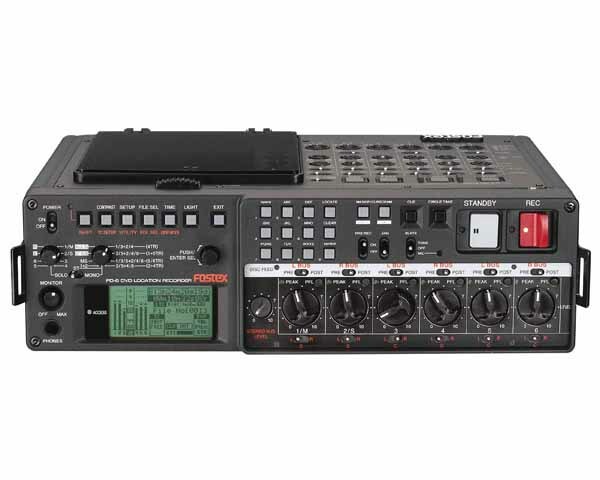 Fostex PD-6 Portable Location Recorder, a recorder which offers spectacular 24-bit / 96kHz audio quality and six independent audio tracks. A recorder offering timecode-locked DVD-RAM recording to an easy to use 8cm removable media which answers all the new challenges for location recording today. The six channel mixer accepts either microphone level, with both T-Power (12V) and Phantom power (48V) available, or line level. Phase reverse is provided on the three even channels while each channel features adjustable input gain; a generous defeatable and variable high pass filter and an individual defeatable limiter, with software selectable characteristics and linking, suited to location recording.